It looks like a traffic accident, doesn’t it? And it is, if roadside bombing is part of the traffic pattern. Except this photo isn’t from Iraq or Afghanistan. Lebanon has been largely forgotten, somewhat like the invalid living in the house down the block. The country may never be healed or whole again, but at least it seemed to have recovered some civic equilibrium, some distance from bombings, mayhem, and ruin. Perhaps that’s why the driver–an Italian peacekeeper–looks so stunned. Beyond the shock of the explosion, he seems to be struggling to comprehend what has happened. 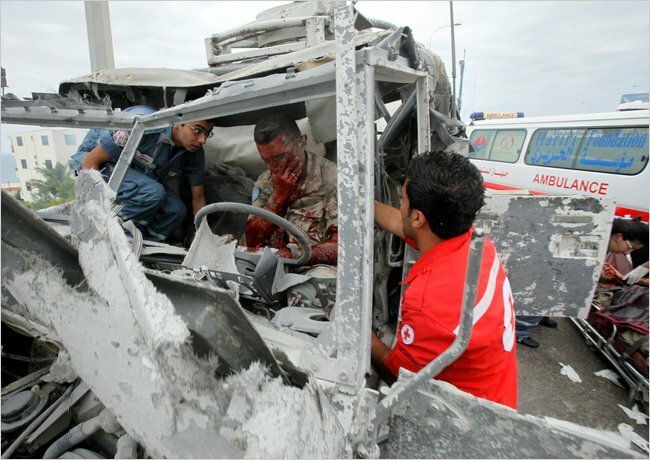 Although wearing a military uniform, he sits there as though the victim of a civilian crash. “Am I alright? What happened? Is everyone OK?” The medical technicians and ambulance fill out the scene (and note that there is another victim in the lower left frame). Even the wrecked vehicle seems as much like a trashed SUV as damaged military hardware. Only the Jaws of Life are missing. But it wasn’t an accident. Bombings are intentional acts. The attempted (and perhaps actual) murder apparently is a part of life on this thoroughfare. Civilian first responders do their job; after all, the military presence of the “peacekeeper” was already part of the urban fabric. The violence is undertaken to blow up the settled arrangements of civil society, and to replace the daily negotiations of traffic and politics alike with a new order of force and fiat. Of course, the old order was also grounded in force and fiat, for Lebanon has been a country wracked by armies and inequities for decades. The point here is not to sort out its political gerrymandering, but rather to note how it is a small example of larger processes by which war becomes woven into the normal operation of society. The photograph seems to have revealed the exact line between civic order and political violence. It can been seen as an image of guerrilla attack and military casualties, or as one of the small disasters that punctuate ordinary life on the street. It is both, of course: an example of civic war: the condition of citizenship being overwhelmed by violence, and of that violence becoming part of the fabric of civilian life. The ambulance and first responders signal that the emergency here is the “accident”–the specific vehicle and victims–but not the broken country itself. Yet Lebanon lives in a permanent state of emergency, and though relatively quiet compared to some neighborhoods in the region, the bombing reminds us how it is still kept on the verge of catastrophe. The vehicle seems to be leaning to our left. Perhaps the photo has revealed not only an invisible line but also a tipping point–the moment when the country could again fall from being a relatively civil society into a binge of assassinations, assaults, and invasions. Or perhaps a new equilibrium is already in place, the steady state of civic war and its new normal of everyday violence. Photograph by Sharif Karim/Reuters. For more on the term “civic war,” see Peter Alexander Meyers, Civic War and the Corruption of the Citizen (Chicago: University of Chicago Press, 2008).